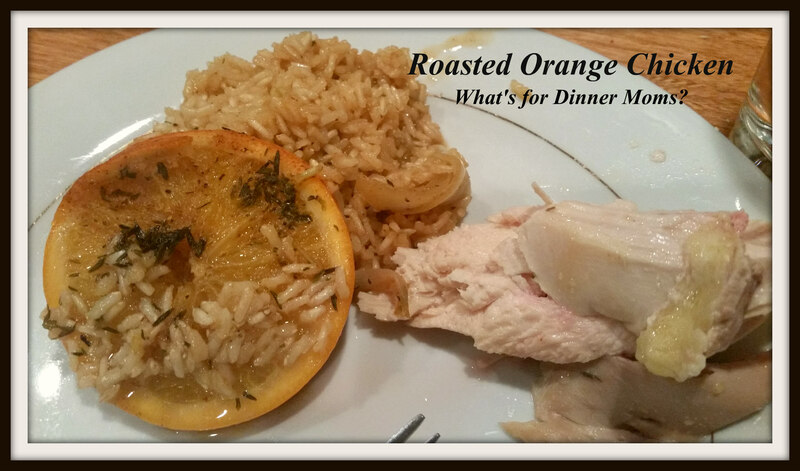 Orange Roasted Chicken with Rice – What's for Dinner Moms? My mother gave me a new pan for Christmas. This was my first trial run with the pan. Though it worked good I realize I need to work more on when to cover and uncover dishes to get that nice brown skin that I wanted. In my old roasting pan I never thought about it but this time I added rice to the dish which changed things a bit for me. The chicken was perfectly cooked. The kids LOVED the rice. Even my rice hating daughter said we need to make this again. 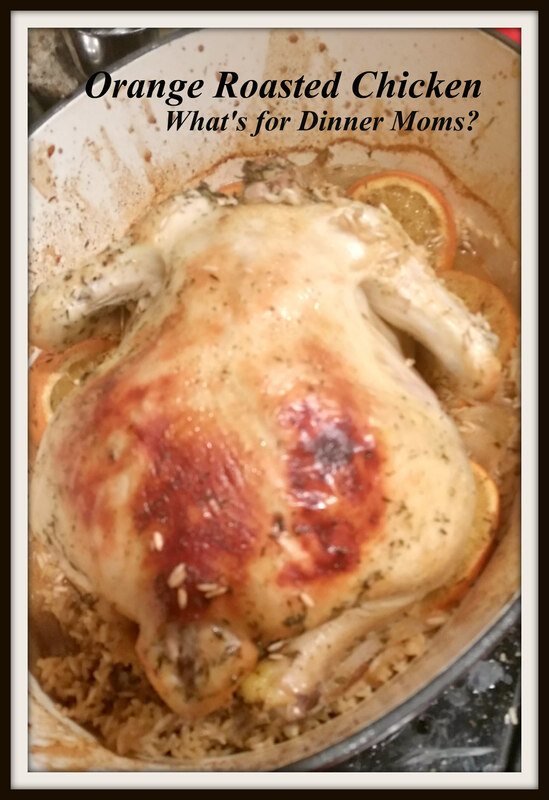 It had a great orange flavor, the chicken was juicy and it was super simple to make! I served this dish with a green side salad and broccoli to complete the meal. 1 whole chicken, 4-5 lbs. Preheat oven to 400 degrees. Move rack to lowest setting in the oven. In a bowl stir together, honey, thyme, cumin, paprka, and red pepper flakes. Rub your pan with olive oil to coat the sides and bottom. Place rice in the bottom of the pan with chicken stock and onion. Salt and pepper the chicken on all sides. Lay the chicken on top of the rice. Pour the orange juice mixture over the chicken and tuck the orange slices around the chicken. Place pan in oven for 60 minutes. Baste chicken every 15 minutes and stir rice if you can. Cover chicken after 60 minutes (if brown enough), check liquid in rice that it is absorbing and will not burn. If needed add a bit of chicken stock and continue to bake for 20 minutes. Remove chicken from oven and check temperature. It should be 160 degrees in the center of the breast. Remove and leave covered for 5 minutes or until the temperature rises to 165 degrees. Remove chicken from pan and cut. Stir and serve with orange rice. Thank you! It was orangey! I love roasted chicken! It looks great, Marci! Thanks for stopping by! I like oranges better than lemons so decided to give it a try. It was surprisingly tasty! Experiment with it and have fun! Thank you, Lynn! I love it. Oh nice. Adding orange in place of lemon is great idea! Easy switch for a new take on a dish. Love it.